Hal Gregersen is a regular contributor to Forbes, Fortune, and Harvard Business Review, exploring how asking the right questions builds leadership, innovation and ultimately can change our world. About 20 years ago I was leading a brainstorming session in one of my MBA classes, and it was like wading through oatmeal. We were talking about something that many organizations struggle with: how to build a culture of equality in a male-dominated environment. Though it was an issue the students cared about, they clearly felt uninspired by the ideas they were generating. After a lot of discussion, the energy level in the room was approaching nil. Glancing at the clock, I resolved to at least give us a starting point for the next session. Donald Trump has effectively gone from managing his family-owned real estate company — and his own career in show business — to running the executive branch of the United States. That’s a pretty big leap. Business Insider asked four management experts to weigh in on Trump’s management style. They didn’t discuss his politics — just his performance as the leader of the executive branch of government. Humans have an average eight-second attention span. You’re going to need to do a lot better if you want to get things done. Donald Trump rode into the White House on a promise that he’d be a strong leader who could run the government with the efficiency of a CEO. He’d hire “the best people” and manage the country with the same success that he has had running his business empire. The reality has been much, much different. Tesla. The company name evokes very different yet equally strong responses from critics and fans. Critics argue Tesla loses money on each car sold. Indeed, with losses of $290 million in 2014 and $888 million in 2015, it’s unclear when the company will eventually hit profitability. The race for the White House provides a powerful reminder not to shield yourself from outside opinions. Are you aware of your or your organization’s blind spots? If you answered yes, you’re just plain wrong. They wouldn’t be blind spots, if you knew about them. The question is, how can you diagnose them before they sink you, manifesting themselves in a powerful, disruptive, surprising new competitor? Most companies hold brainstorming sessions that identify solutions, but Hal Gregersen, executive director of the MIT Leadership Center and coauthor ofThe Innovator’s DNA: Mastering the Five Skills of Disruptive Innovators, suggests holding “question-storming” sessions that think of nothing but questions about a problem for a given period of time. “When people care about the issue, when they have thought a lot about the issue but they are stuck, that’s the point at which it’s perfect to step back and say: ‘Okay, question storming time,’” he says. Question storming a long series of questions gets you closer to the right questions that will give you the right answer, says Gregersen. “And that’s where question storming complements traditional brainstorming,” he says. Hal Gregersen has been named to the Thinkers50 global ranking of management thinkers, the world’s most prestigious ranking of management thinkers. 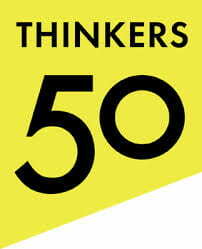 Published every two years, the Thinkers50 global ranking is the essential guide to which business thinkers and ideas are in – and which have been consigned to business history. The Executive Director for the MIT Sloan School’s Center of Leadership, Gregersen is coauthor (with Clay Christensen and Jeffrey Dyer) of The Innovator’s DNA: Mastering the Five Skills of Disruptive Innovators (Harvard Business Review Press, 2011), and founder of The 4-24 Project, which is committed to building the next generation of innovators. His current research, with Clay Christensen, is focused on the power of questioning and how the most successful leaders are able to identify the right question – rather than the solution – to unlock a vexing challenge. His other co-authored books include: It Starts With One: Changing Individuals Changes Organizations (Wharton, 2008); and Global Explorers: The Next Generation of Leaders (Routledge, 1999). We’ve all been there: You’re feeling out of your comfort zone at work. Your face is flushed, your heart is racing, and your mind is a jumble. Everyone’s waiting for you to get it together. Then someone else jumps in, taking control with confidence and utter calm. Why are you so flustered while some of your colleagues can handle these situations with grace? Chances are they feel many of the same emotions. The difference is just that they’ve learned to get comfortable with the uncomfortable. That takes practice, not inborn talent. Over time, leaders learn to stretch their comfort levels and modify their environments so it’s easier to respond to tricky situations. This enables them to manage tough circumstances better and to spot and confront challenges earlier. Here are three steps to help you do all that.